Description: The creation of the new Department of Veterans Affairs in 1989 required a new official seal to represent VA. In November 1988, after the law establishing VA as a cabinet department was signed, VA initiated a competition among employees for a seal design that would give the new department a "new look." 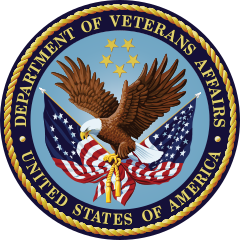 The winner of that competition, and creator of today's VA seal was David E. Gregory, a medical media production specialist at the Indianapolis VA Medical Center. These are the key elements of the seal, as he described them: The eagle represents the United States. The circle of five stars above the eagle represents the Army, Navy, Air Force, Marines and Coast Guard. The two flags in the eagle's talons represent the span of America's history from 13 colonies to the present 50 states. The flags are bound by a golden cord symbolic of those Americans who have fallen in service to their country. The eagle holds the cord to perpetuate the memory of those veterans who have fallen and sacrificed for the nation. More information here. This page was last modified on 21 February 2017, at 11:57.